Wow this is my first review on BookLikes and I'm going to start with a book I mentioned in a previous blog post "The Ghost Hunter's." Now if a book contains any element of truth I'm really interested to read it and see how fact and fiction blend. 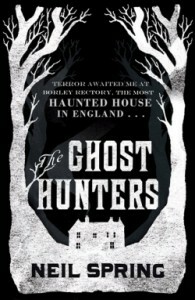 "The Ghost Hunter's" is told from the perspective of Sarah Grey, a young women, who in 1926, becomes assistant to Harry Price one of Britain's best known psychic investigators. Having lost her father in the war, it is Sarah's mother who becomes obsessed with finding a medium who can let her speak to her late husband; and it is through this search Sarah encounters Price for the first time. Price is determined to expose fake mediums as he doesn't believe authentic ones exists, and it is this work Sarah helps him with. But everything changes when a national paper asks Price to investigator Borley Rectory; as the night Sarah and Price spend there changes both their lives for ever. In this his debut novel Neil Spring weaves fact and fiction effortless to give a new take on both Harry Price and Borley Rectory. Now if you are looking for a horror story, you will need to look elsewhere as this book is psychologically driven. Sarah Grey's character is Neil's creation, but she is a very likable and well crafted. You can almost feel her pain at different stages throughout the book. Harry Price had the reputation of being the best known psychic investigator, not only in Britain but beyond. These days a lot of his work, especially that on Borley has been dispelled as fraudulent, and in this book Neil portrays him as a secretive man who is also cunning and deceitful. No one knows for sure just what happened at Borley Rectory, but even today it is still something of an enigma. Did Price fabricate a lot of it as purported in the book? We shall never know, although even today there reports of strange happenings in Borley Church. This a wonderful book and I can't recommend it highly enough.